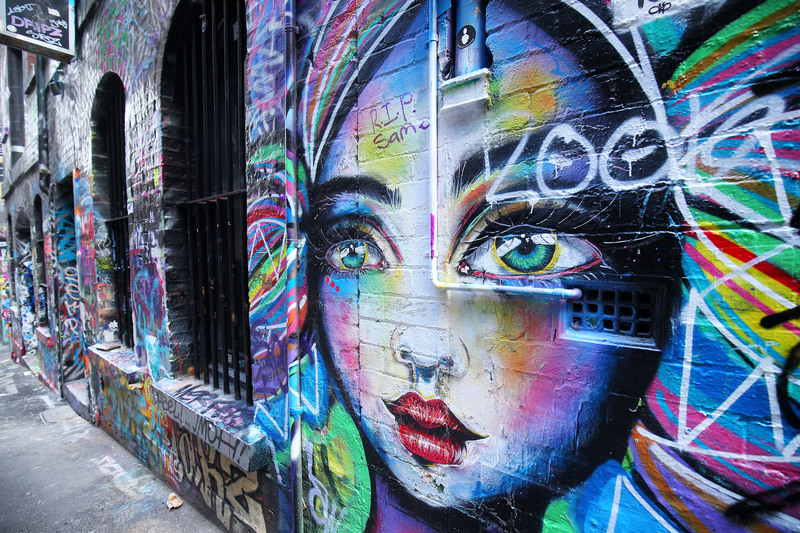 When you think Melbourne, some of the words that come to mind surely must be 'coffee', 'laneways' and 'street art'. 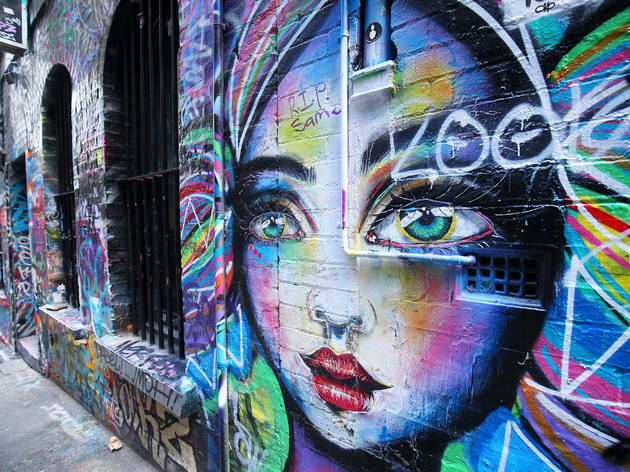 Street art covers almost every nook and cranny of our creative, colourful city, but there are more highly concentrated clusters than others. 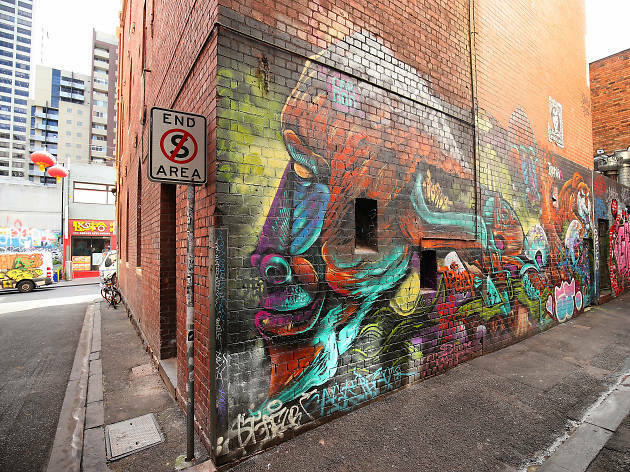 These are the street art hotspots that any self-respecting 'grammer should be snapping: the city's ten best street mural hotspots, in all their spray-painted laneway glory. 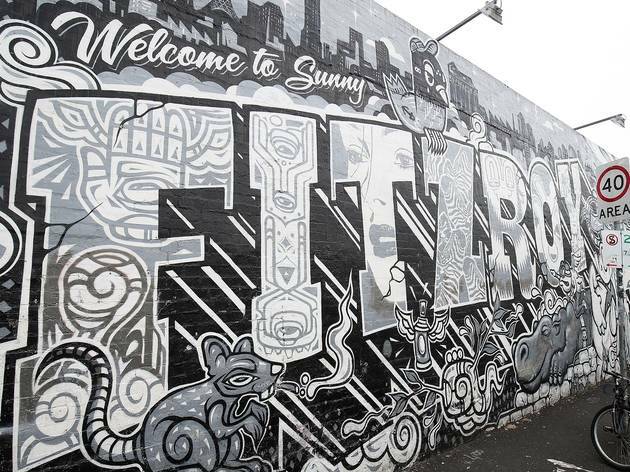 Continue your art journey through Melbourne at these free galleries, or purchase your very own piece of art at one of these weird and wonderful shops. 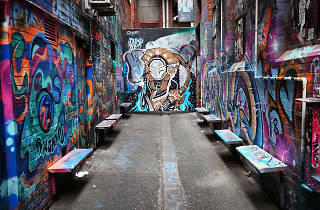 Opposite Federation Square and joining Flinders Lane with Flinders Street, the cobblestoned Hosier Lane is arguably the central point of the city's street art scene. 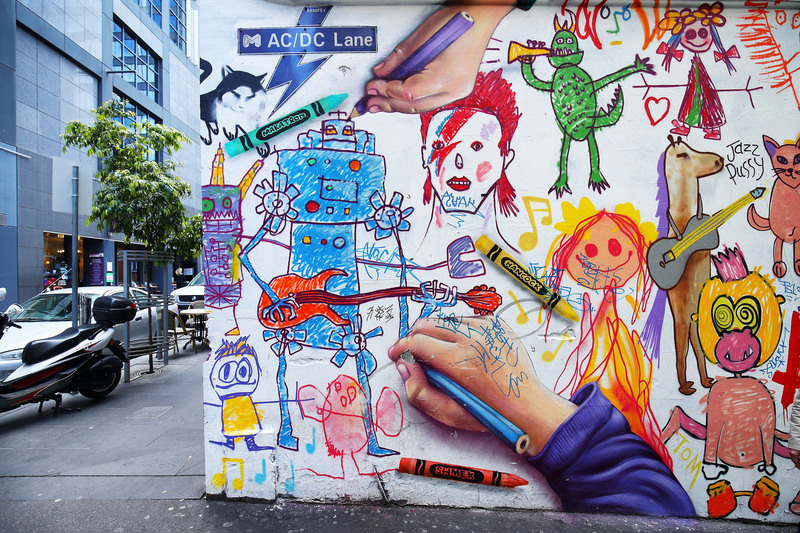 Spend a long while checking out every little bit of this overflowing art cluster – a creative mark has been left on almost anything with a surface and sometimes it's the smaller, easily-overlooked pieces that really astound. See the exact location here. 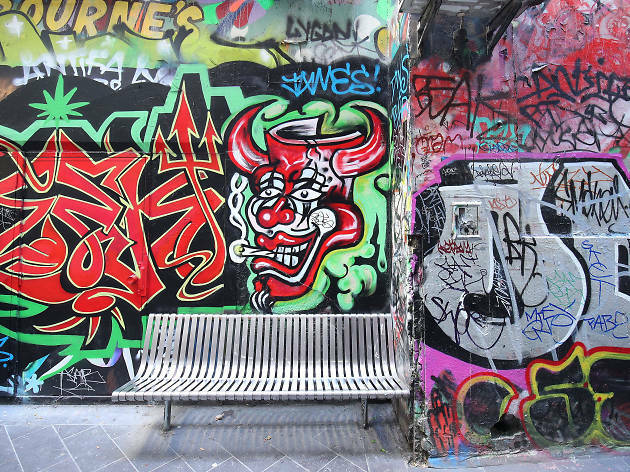 Find it between Collins Street and Flinder Lane and feast your eyes on some of Melbourne's most high-profile and elaborate stencil work and graffiti art. 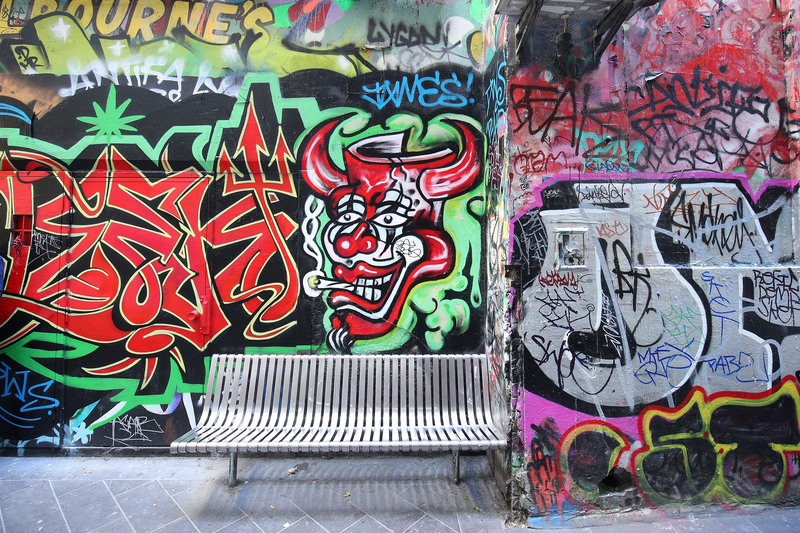 Running off Flinders Lane, AC/DC Lane was named back in 2004 to pay tribute to the Australian rock band. 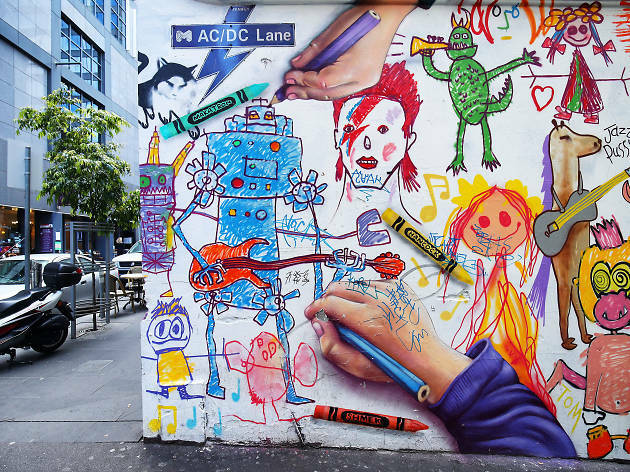 As you might expect, the street art features all kinds of musicians – both real and imagined. 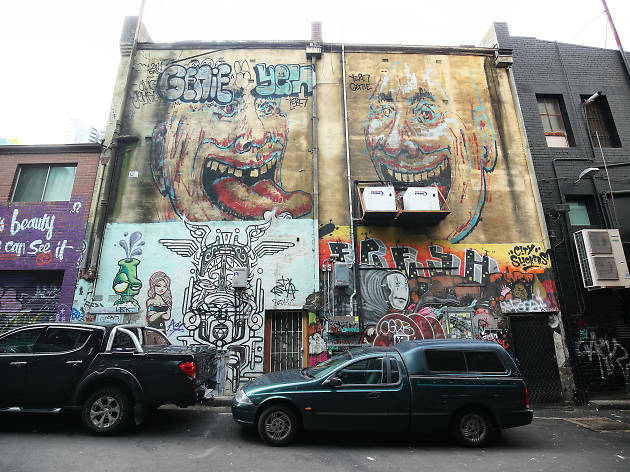 The lane is also home to the legendary live music venue, Cherry Bar. 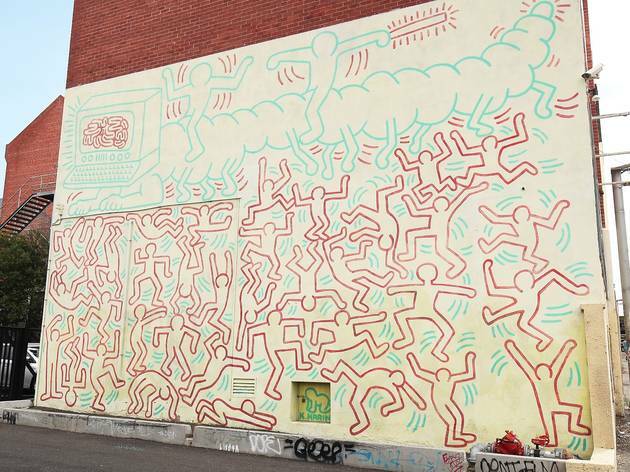 The late but legendary New York artist Keith Haring created this mural for Melbourne back in 1984, and it's been one of the city's favourite pieces of public art ever since. It had a significant restoration back in 2013 and is now looking pretty wonderful at its original location on Johnston Street in Collingwood. 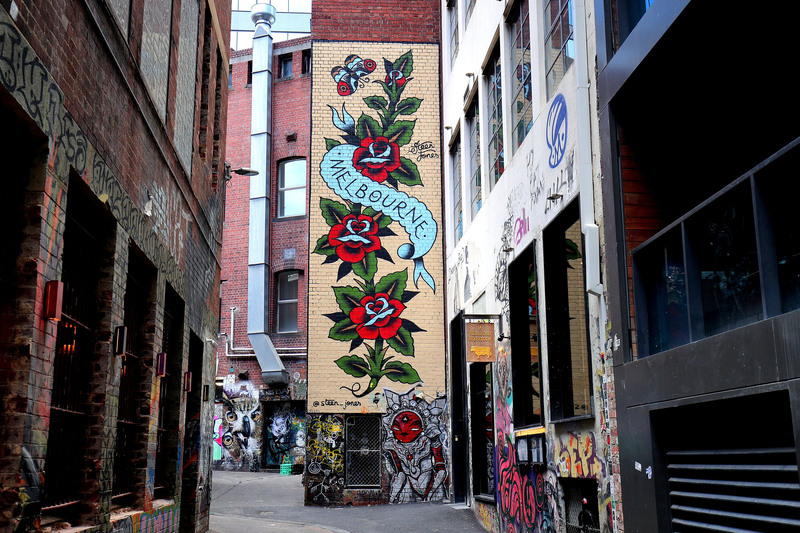 Caledonian Lane is one of those super-small Melbourne laneways, but it also has a big history: this was the birthplace of the now international festival, St Jerome's Laneway. 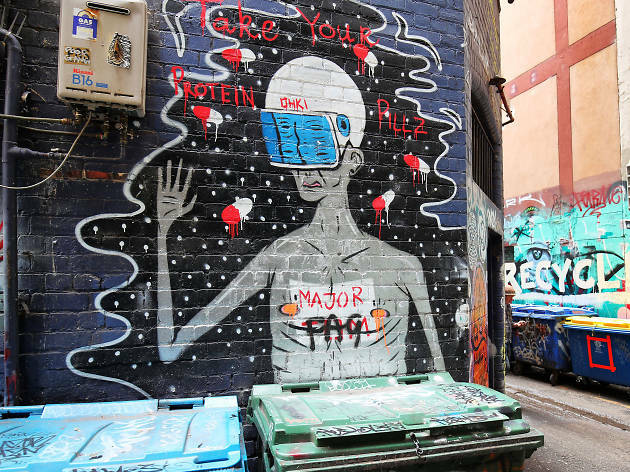 The laneway, which is just off Lonsdale Street and hiding behind Swanston, has changed significantly since then, but there's still plenty of art to feast your eyes on. 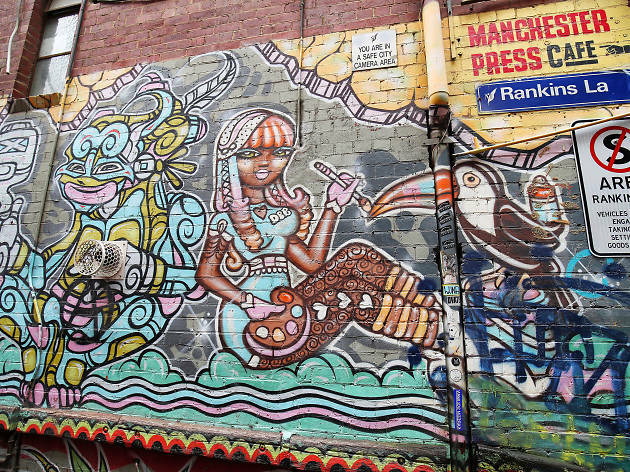 Right in the centre of Chinatown, Croft Alley winds off Little Bourke Street. 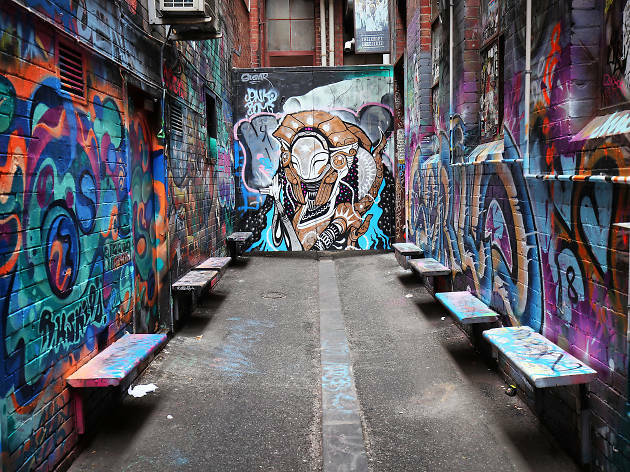 At the end of the alley, you'll find one of Melbourne's favourite laneway bars, Croft Institute. 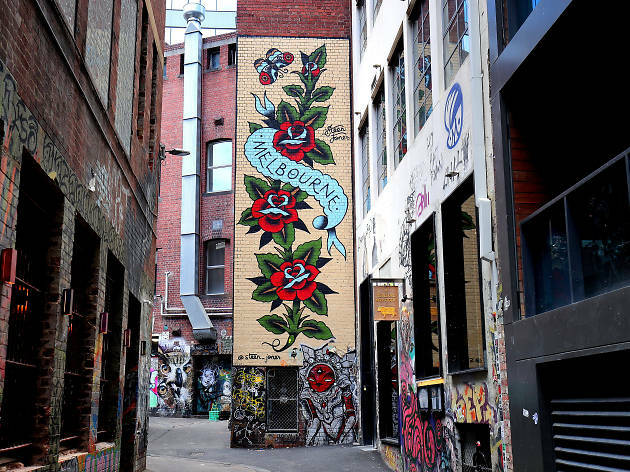 Duckboard Place curves around from Flinders Lane back to AC/DC Lane. 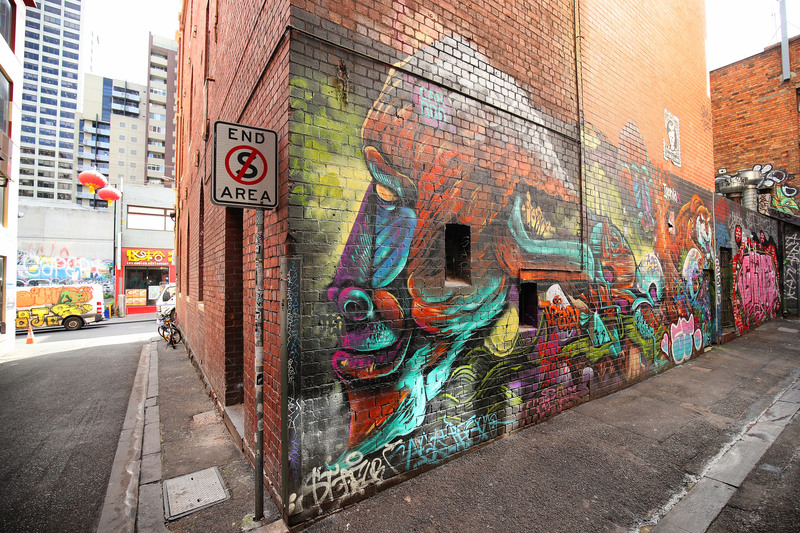 In addition to several significant murals, Duckboard Place is home to some high end restaurants, including Lee Ho Fook. 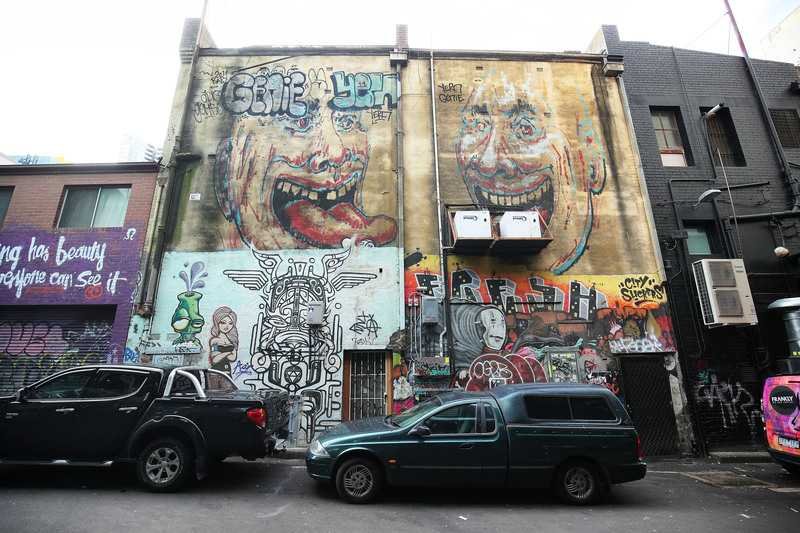 Just around the corner from Bourke Street Mall, Rankins Lane is a fairly narrow, unassuming brick lane. 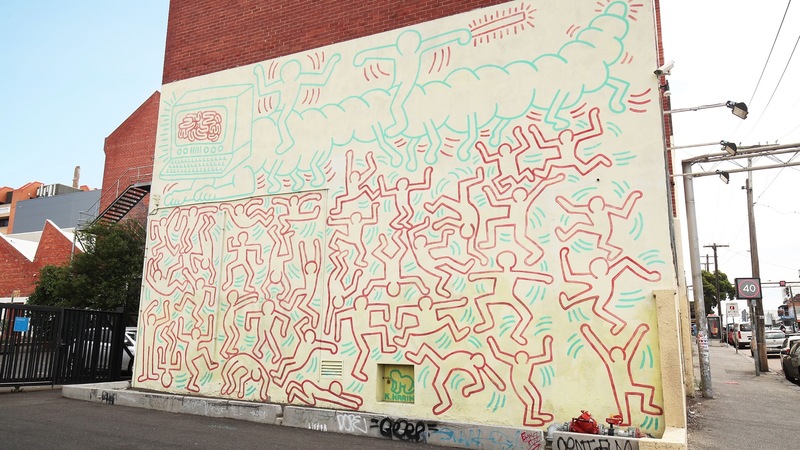 But it's also home to this art work. 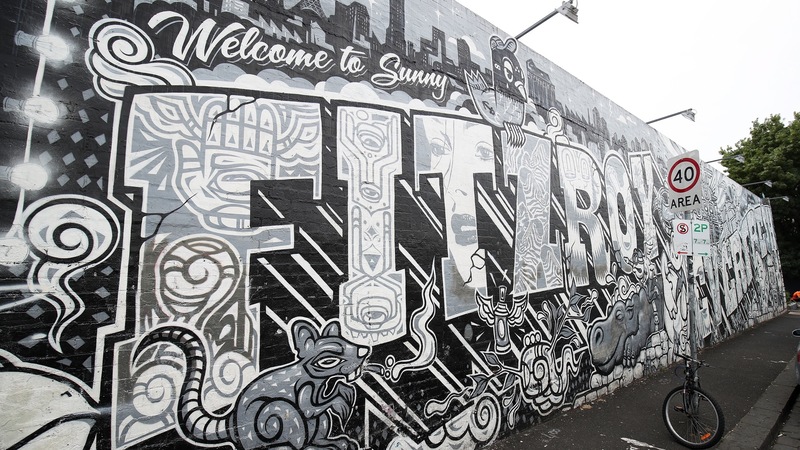 This large graphic mural, which declares "Welcome to Sunny Fitzroy", sits on the side of the long-standing live music venue The Night Cat. 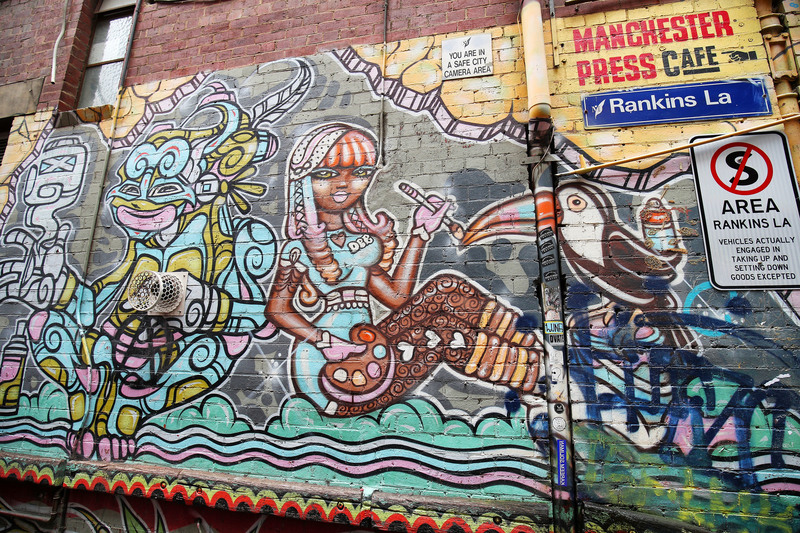 It was painted back in 2009 by Melbourne street art crew Everfresh, and can be found on the corner of Johnston and Young Streets in Fitzroy. 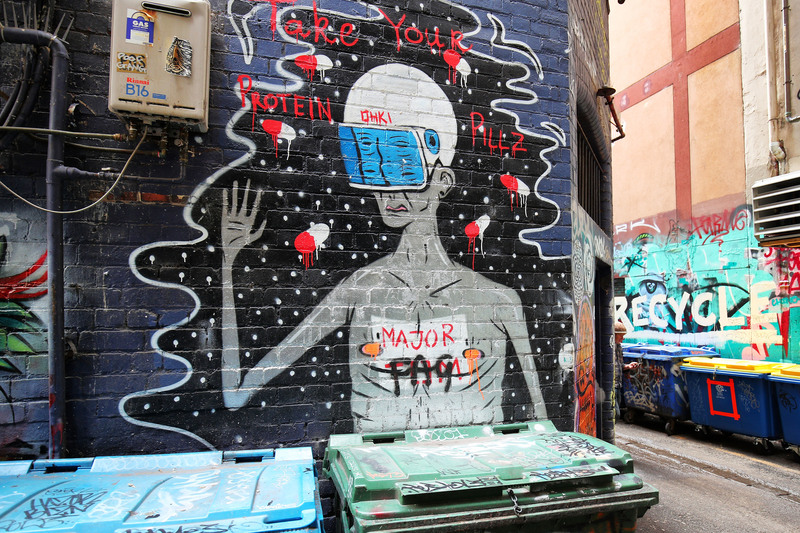 Stevenson Lane is particularly tiny, right by the corner of Swanston and Lonsdale Street, but you can find this mural. 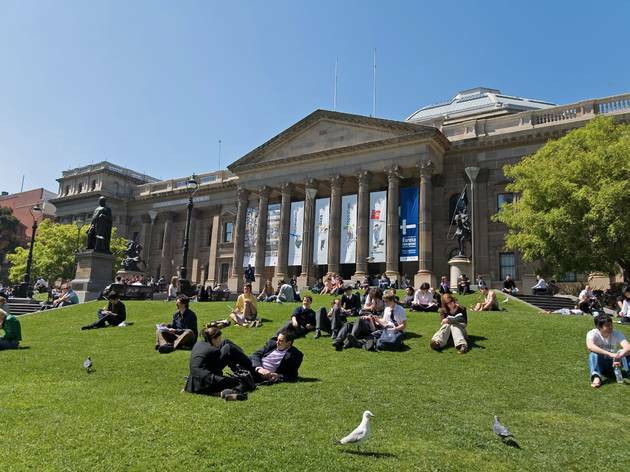 Getting up close to world-class art shouldn't cut a healthy slice out of your salary. We know that, and thankfully, so do many of Melbourne's best art galleries. From small commercial galleries to the big players, we've rounded up our favourites spots for looking at art when the wallet is thin.